A daredevil aiming to set the record for world's highest skydive moved one step closer to his goal today (March 15), completing a practice jump from more than 13 miles up in the stratosphere. Austrian skydiver Felix Baumgartner stepped out of a custom-built capsule at an altitude of 71,581 feet (21,818 meters), officials with Red Bull Stratos — the name of Baumgartner's ambitious mission — announced today. He plummeted to Earth in a freefall that lasted three minutes and 43 seconds, reaching a top speed of 364 mph (586 kph). Baumgartner deployed his parachute at 7,890 feet (2,405 m) and eventually landed safely about 30 miles (48 kilometers) from Roswell, N.M., project officials said. Baumgartner had lifted off from Roswell in his capsule at about 10 a.m. EDT (1400 GMT), borne aloft rapidly by a balloon. Once he reached 71,581 feet, the 42-year-old daredevil ran through a 39-step safety checklist, depressurized the capsule and stepped out into the thin, frigid air of the stratosphere in his custom-made spacesuit. From leap to touchdown, the entire test flight lasted just over eight minutes, officials said. According to Baumgartner, the toughest part of the dive was the extreme cold he experienced high up in Earth's atmosphere. "I could hardly move my hands," the skydiver said in a statement. "We're going to have to do some work on that aspect." 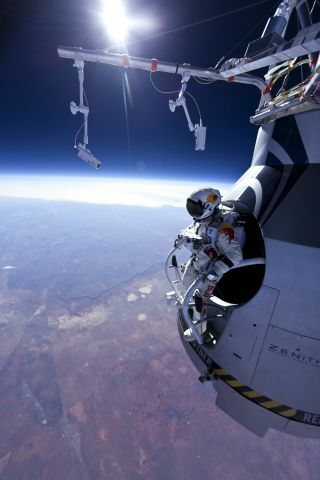 Baumgartner is gearing up for an even bigger leap — his so-called "space jump" — from 120,000 feet (36,576 m) this summer. The current record for highest-altitude skydive is 102,800 feet (31,333 m), set in 1960 by U.S. Air Force Captain Joe Kittinger. Baumgartner hopes his attempt will also set several other marks. He is chasing the record for longest freefall (estimated to be about 5 minutes and 30 seconds from 120,000 feet), and he hopes to become the first person to break the speed of sound during freefall. Today's successful flight is a significant milestone, Red Bull Stratos officials said. It gave Baumgartner a taste of what he's in for with his record attempt, and it allowed the team to gauge how well his suit and other equipment held up. Prior to today's jump, Baumgartner's highest-ever skydive was from 30,000 feet (9,144 m) up, according to team officials. Baumgartner and his team had hoped to make his record jump in 2010, but they were delayed by a legal challengethat claimed the idea of the dive was earlier suggested to Red Bull by California promoter Daniel Hogan. That suit has now been settled out of court, and the Red Bull Stratos project is moving forward.